Some good news :-) We've achieved several thousand hatchlings from Elle's spawning. We reared them in the fry pond within a cage net made from a material with 0.5mm hole size. This is the second time we've successfully reared eggs in this way - the first time was with the shiro eggs a few weeks ago. I've tried something new this time though - instead of releasing the hatchlings at around day 7 or 8, I've left them in the cage net for another few days. My theory is that the rotifers can pass into the cage net (and be eaten by the hatchlings) but the larger bugs cannot , and therefore the hatchlings are protected from those during their most delicate stage. The pond these eggs have matured in is full of daphnia and whilst I'm not too worried about them, I am concerned about the cyclops which predate on newly hatched fry. The net is fine enough also to keep the hatchlings within it too. After almost an extra week in the cage net, the hatchlings have grown and I've released them into the fry pond. During that extra week, the pond has calmed down considerably and is looking much more hospitable for the hatchlings than when I introduced the eggs. So it's fingers crossed time. I'm used to estimating numbers of hatchlings by seeing them in a bucket - i know what a few thousand look like in a bucket and can extrapolate from there. I took care releasing the hatchlings - they're like gold dust! 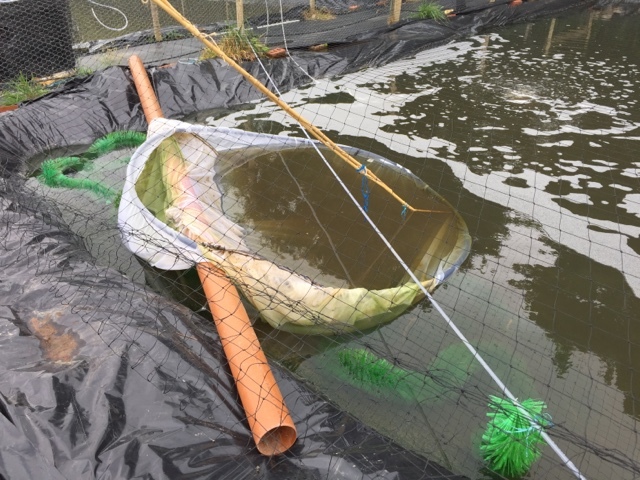 I took several hours over it , dropping one side of the cage net into the pond and slowly making the cage smaller in stages to help the hatchlings find the exit. I moved the spawning ropes into the pond just in case any hatchlings were caught in them .... And I did spot one or two swim off from the ropes. With Elle's hatchlings - I can see there are a few thousand, but couldn't estimate so well . If I was being optimistic, perhaps 10k of them. But it could easily have been just a few thousand. I'm just happy there are enough for me to at least rear a good sample from this new brood fish and parent set combo. It's a waiting game now to see how the hatchlings fare in the pond over the next few weeks. Reflecting on the summer - we've been successful at filing the fry ponds with hatchlings 4 times this year. Twice with bumper loads, and twice with around 10k. That's a big improvement on last year. And it's the best we've done since starting the project. The other news is less good. We've had an outbreak of white spot in the females tank. Despite treating the tank ( and our other tanks ) 3x with MG&F after returning from the EoE koi show - 10 days after that final treatment we had white spot in the tank. The really bad news is that we lost one of our shows females - a notable tancho showa. It's gut wrenching and the first loss of an adult koi we've suffered through parasitic involvement since we started keeping koi. It's been an experience and reminder about just how virulent white spot can be. When I spotted the outbreak, we started another set of MG&F doses and it was during the second dose that we lost her. She was too weak to deal with the treatment. A few days after that second treatment, the fish showed signs of improvement, in their general behaviour and sore patches healing up. I've taken each tank through the same process to ensure the parasite can find no hiding places! For the final part of the treatment, I've salted up the tanks which i will hold for a few weeks. It's not orthodox to complete the treatment cycle in this way but I don't have a lot of time available for the fish over the next week and I know this will knock it on the head, and the fish will be protected. If I can , I'll run two more spawnings and try some indoor rearing techniques. I'm going to give the shintaro showa another go, and there's the chance to spawn my reliable female for the second time this year. The polytunnel will keep extend the summer and I'll try rearing hatchlings with brine shrimp and perhaps some artificial food. At the very least this will give me some experience with these techniques and you never know, we could end up with some decent fry out of it too.